Nearing retirement how much life insurance do you need? If you are nearing retirement how much life insurance do you need? This is one of the big questions that many retiree’s ask themselves. There are good reasons for having life insurance. However if you do not fit into these, you may not need life insurance. We have been wondering about this question for some time. There is no single answer for everyone. Instead it depends on your personal situation, your risk tolerance etc. Some people just do not care. Others cannot afford to pay for life insurance. 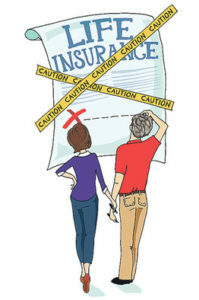 Many have not really thought about the question and have no life insurance. This post attempts to list some of the reasons a consumer should consider life insurance coverage. It also assumes that the average consumer can afford the monthly payments and feels that they want to take responsibility for their family, debts that they may have and of course providing for their loved ones. Fundamentally, life insurance is purchased to provide cash after you have passed away. The reasons vary, but it really comes down to this one issue. If you have a lot of debt and want to have this debt disposed of when your gone, life insurance can solve this problem. Car loans, mortgages, personal loans and credit card debt can all be paid off by life insurance. Add up your total debt and arrange for enough life insurance to cover this amount. Your family will not have to sell your assets to pay for your debt that remains after you are gone. Another reason many people have life insurance is to provide income for their dependents after they are gone. You might need to have a great deal of insurance coverage if you want to replace your income with income from investments. For example a one million life insurance plan will generate $50k at 5% if it is fully invested. Depending on your age you could also draw down on the principle. Combine your debt repayment needs and your income generation needs to determine the total amount of insurance that you require. Every year re-evaluate your needs, especially nearing retirement how much life insurance do you need?